Brief Synopsis – The emotional innerworkings of a young girl’s mind are shown to us as she tries to develop herself amidst major changes in her life. My Take on it – I saw this movie for the first time almost 5 months ago and I have thought so much about it in the interim because this movie’s premise leaves so much to ponder. This is still by far my favorite movie of 2015 (so far) and it won’t be easy for other movies to top it as the Award season films slowly get released from now until the end of the year. This movie gives us all amazing insight into what possibly goes on in our heads in order to make us who we are; thoughts, emotions and of course every other action that we do. The script that they wrote here is unbelievably clever but also so intelligent that it seems quite plausible that this is how each of us act and react during the decision making process in our minds for everything that happens for us. The voice cast is Amazing (as usual for PIXAR). My favorite is most definitely Lewis Black who is superb as the emotion of Anger. After having discussed this with so many people, it is easy to see that despite this being an animated film, there is so much more for adults to harvest from the premise than most kids. The level of intelligence and structure of the movie truly seems more geared to adults than kids (which is perfectly fine), but I find that to be a shame for the kids because they then miss out on so much. PIXAR has made some truly amazing films, but this one has shot up to near the top of the list because of its charm, intellect and above all, it’s very emotional storyline. I once again can’t wait to see this movie on the next chance I get. Bottom Line – Still my absolute favorite movie from this year and I’m curious if that title will be taken away over the next two months. Gives us great insight into how our minds, emotions and actions work. Great script that takes into account so much of what possibly goes on in our heads directing our actions and decisions. Great voice cast, especially Black as Anger. More for adults than for kids because there is so much to think about. 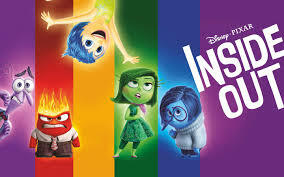 One of the best films to come out of PIXAR and that is not an easy task to accomplish. Highly Highly Recommended!